Australia is a melting pot for some of the most diverse fauna and flora in the world. The country offers a multitude of scenic possibilities from the oceanic Great Barrier Reef, to the starkly beautiful Great Victoria Desert. It should come as no surprise, as a result, that Australia offers a plethora of picturesque day trips that would be at home on just about anyone’s bucket list. The abundance of options does, however, make it difficult to whittle it down to a list less daunting for the average Lost Backpacker. The following is a list of three possibilities that are frequently listed as some of the most unmissable. The Blue Mountains was made a World Heritage site in 2000 and gets its name from the blue hue of the mist topping its peeks. The area covers more than 10,000 square kilometers and visitors from Sydney are just a 90-minute drive away. 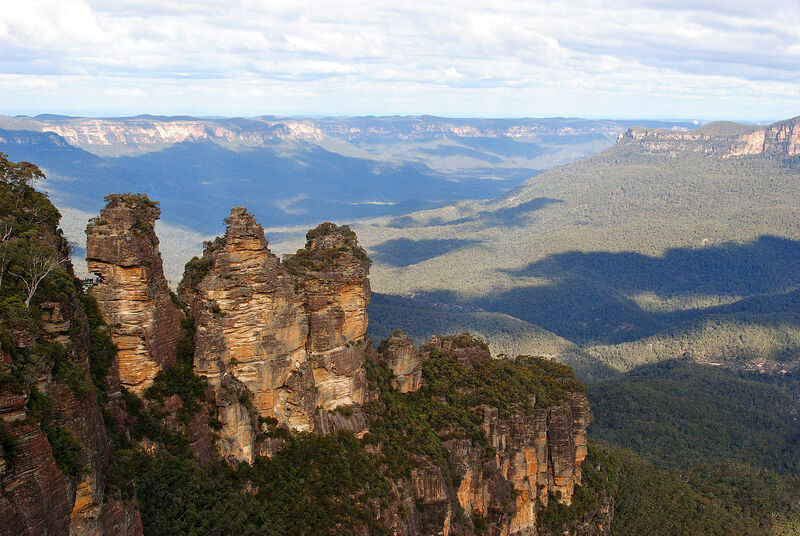 The Blue Mountains offers a number of activities that could keep anyone entertained for months. For the petrol heads, Tread Lightly Eco Tours offers a 4WD experience through some of the most beautiful scenery the mountains have to offer. Packages for the tours start from $270. Blue Mountain Mystery Tours offers a unique look at the parks legends, myths, and even its ghost stories. The tours start from as little as $75 per person for the Ghost Tours and $185 for the full Mystery Tour. The tours also offer multiple day packages for those looking for more than a day trip, and has been offered as a prize in the Euro Palace weekly promotions, showing the popularity of this particular attraction. If you want to explore the Blue Mountain reserve from the perspective of the gods, the Trees Adventure is for you. The adventure will see you exploring from the trees as you swing, leap, and climb above the forest floor. Tickets for the Trees Adventure start from as little as $25 per person. The city of Canberra is the capital of Australia and with its unique urban design bears more resemblance to a forest than one of the largest cities in Australia. The city was designed by a Chicago based architecture firm and celebrated its centenary in 2011. Like many large cities around the world, Canberra offers an abundance of tourist friendly activities and destinations for the Lost Backpacker. For the inventor amount us, Questacon offers a mind-blowing selection of science activities, the latest technology and even an Earthquake simulator. Although it is targeted at a younger audience, it is easier for even the sternest of travelers to let loose on the thousands of displays. Questacon is open from 9:00am to 5:00pm every day and entrance will cost $20 for adults and $15 for children between 4 and 6. The War Memorial is a lot more than the name gives it credit for, with the honour roll only being a small part of sum of what is on offer. The memorial is a Lost Backpacker family-friendly option that will offer as much interest for the adults as with the children. It offers tours that feature miniature models of famous battles, a hall of decommissioned aircraft, and even a chance to feel what it was like in the trenches. For the children, the memorial offers a life size submarine and helicopter that they can explore. The War Memorial is open from 10:00am to 5:00pm from Monday to Friday and 1:00pm to 5:00pm on Saturdays. Visitors to Canberra can also enjoy the National Gallery of Australia, National Museum of Australia, National Film and Sound Archives, Australia’s National Archives, Capital Hill, and much more. No visit to Australia would be complete without a visit to Darwin. The city gets its name from the naturalist Charles Darwin, the author of the Origin of Species, the seminal work in the study of evolutionary theory. The Bicentennial Park is located across the entire length of Darwin’s waterfront and Lameroo Beach. The park features a cornucopia of memorial attractions including the Cenotaph War Memorial, the Civilian Memorial and The USS Peary Memorial all of which are strikingly beautiful in their own way. The park features an amazing collection of fauna and flora, as well as, picturesque seafront views no matter where you are in the park. The Rock is for the adrenaline junkies and is located inside old WWII oil storage tanks at Doctors Gully. This indoor rock climbing facility features a variety of difficulty levels from beginner to an advanced route that will challenge even the most experienced climbers. The setting for The Rock could not be more perfect as it is located in a lush tropical forest, a must visit in itself. Visitors to Darwin can also visit the Darwin Military Museum, Northern Territory Library and the Museum and Art Gallery of the Northern Territory.